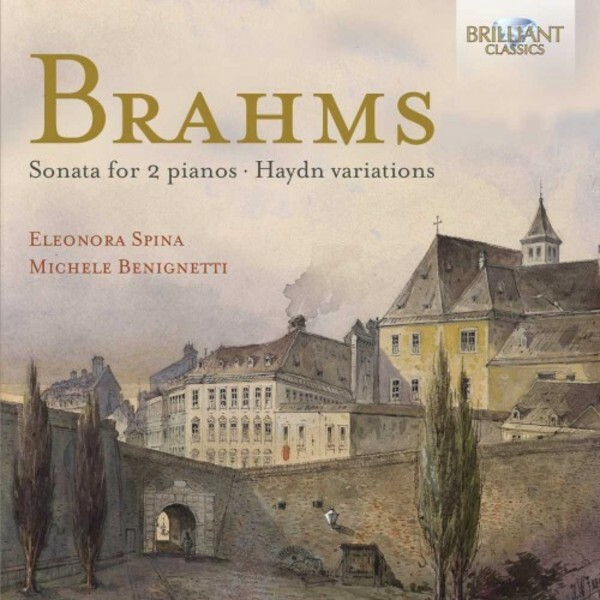 Brahms’ Op.34 is one of the many attempts of the young composer at a large symphonic form. First conceived as a string quartet, his friend - the great violinist Joseph Joachim - found it not suited for strings, so Brahms wrote a setting for two pianos, which he premiered himself with Carl Tausig. Again on the advice of a close friend, this time his beloved Clara Schumann, who found the work too grand in scope to be limited to two pianos, he wrote a version for piano and strings, the piano quintet Op.34a. However Brahms still favoured the version for 2 pianos, which indeed is a master piece in its genre. The Haydn variations Op.56 were simultaneously composed for 2 pianos and for orchestra. This ever popular work is often heard in concert, and shows Brahms as the genius of the variation form, transforming the popular St Antoni Chorale into variations of great invention and different characters, from tenderness, playfulness to the joyful maestoso finale. These are excellent performances by a young Italian duo, Michele Benignetti and Eleonora Spina, winners of several international chamber music competitions.